Once again, I rely on the Roden website for a historical background. In the Spring of 1917 the RFC received a new fighter, the RAF S.E.5. This fighter had potentially very good fighting capability, which was successfully realized by one of the Empire's best aces, Albert Ball, in numerous air duels with the adversary's planes. The only significant disadvantage of this plane was its Hispano Suiza V8 engine whose 150 h.p. was insufficient. This engine was being produced in France and required further improvement. The situation changed shortly after the appearance of Hispano Suiza's 200 h.p. engine, a powerplant which could offer the plane significant improvement. By the end of May in the same year, the third prototype of the S.E.5 with the new engine conducted its first flight. This plane was very similar to its predecessor, however, a few differences still existed: a four-bladed propeller appeared, the keel fuel tank was now installed in the middle of the center section, adjustable radiator shutters were added, the shape of the exhaust manifolds changed, and the huge windscreen was replaced by a regular one. The first test flights proved preliminary expectations to be justified: speed increased by 29 km/h, and climbing time to 5000 m was cut in half. The Royal Aircraft Factory started the mass production of the S.E.5a at its plant in Farnborough even before the test flights were over. Besides that, seven subcontractor firms received major orders to build the type. 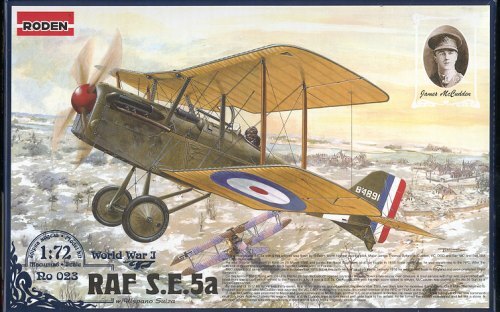 56 Squadron of the RFC was the first to receive the S.E.5a in 1917. The unit that had successfully flown the 'regular' S.E.5, welcomed the new modification of this plane. During its service some insignificant drawbacks were discovered. For instance, the landing gears turned out to be not strong enough. Initially they were made of thin steel tubes, as on the previous aircraft. However, due to the fact that the plane's weight had increased, their structure was soon over-stressed. Later build planes had strong thick wooden landing gears. The engine still continued to be the major problem for the S.E.5a; French plants were building it in insufficient quantities. Moreover, the quality of production was still unsatisfactory. As a result, the engine frequently failed during the flight. Sometimes, such failures led to fatal accidents. The British Military Command tried to solve this problem by purchasing a license for the production of the Hispano Suiza: the engine now went by the name of Wolseley Adder. However, this engine also did not meet expectations because it inherited all the negative features of its predecessor. A very small number of S.E.5a's had this engine. The situation changed only after the appearance of the new Wolseley Viper engine whose design was based on the Hispano Suiza, but with all the Hispano Suiza's drawbacks eliminated. Quite a few planes with Hispano Suiza engines that arrived at maintenance units had the Hispano Suiza engine substituted with a new one. However, a significant number of S.E.5a's fitted with the Hispano Suiza remained in service until the end of the Great War. I'm going to do the almost unthinkable and refer you to the earlier Wolsley-engined preview for a look at the majority of the sprues and an assessment of the kit itself. I can do this because there is little difference between the kits. 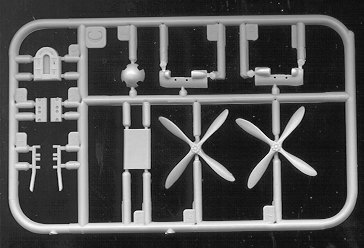 The sprue with the wings and the one with the fuselage is the same. The biggest change is the new sprue for the nose of the aircraft. This includes a pair of four bladed props as well as the different radiator, prop spinner, exhausts and upper fuselage inserts. The flat, rectangular thing is a new lower fuselage vent section. The instructions are excellent as we have come to expect from Roden, providing the needed color information as well as any needed differences required for specific schemes. The colors are referenced to Humbrol paints, but a generic name equivalent is given to help those of us who do not have access to Humbrol. Thank you! RAF S.E.5a D3511 (Vickers-built), No.40 Sqn RFC, Major R S Dallas, Sqn CO, DSO, DSC, Lille, France, May 1918. RAF S.E.5a B139 (Martinsyde-built), No.111 Sqn RFC, pilot unknown, Palestine, January 1918. RAF S.E.5a D'351/ "4"(Vickers-built), No.6(Training) Sqn, Australian Flying Corps, pilot unknown, Minchinhampton, late 1918. RAF S.E.5a D5995/"1" (Vickers-built), No.143(HD) Sqn RFC, Lt. L Lucas, London Air Defence, April/May 1918. RAF S.E.5a B507/"A" (Vickers-built), No.60 Sqn RFC, 2/Lt. J J Fitzgerald, France, October 1917. RAF S.E.5a B4890/"C" (RAF-built), No.56 Sqn RFC, 2/Lt. A Dodds, France, November 1917. RAF S.E.5a C9626 (Vickers-built), No.32 Sqn RFC, Capt. S P Simpson, France, May 1918. RAF S.E.5a B4863/"G" (RAF-built), No.56 Sqn RFC, Capt. J T B McCudden, France, September 1917. For the most part, they are painted Green upper and Linen lower surfaces, though the first example is in a pseudo-French camo with Light Earth and Chocolate Brown added to the upper surface colors. 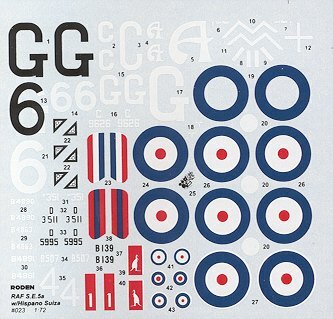 Now I'd be less than honest to say that Roden decals have been a bit of a challenge to get to work properly, but I've seen a number of Roden kits built using them so I'm obviously doing something wrong when applying them. Roden's WWI kits have been well received and there is no reason why this one shouldn't do equally as well. If you are into small scale WWI aircraft, then this is one you should seriously consider. Thanks to the fine folks at . Visit them by clicking on the logo.